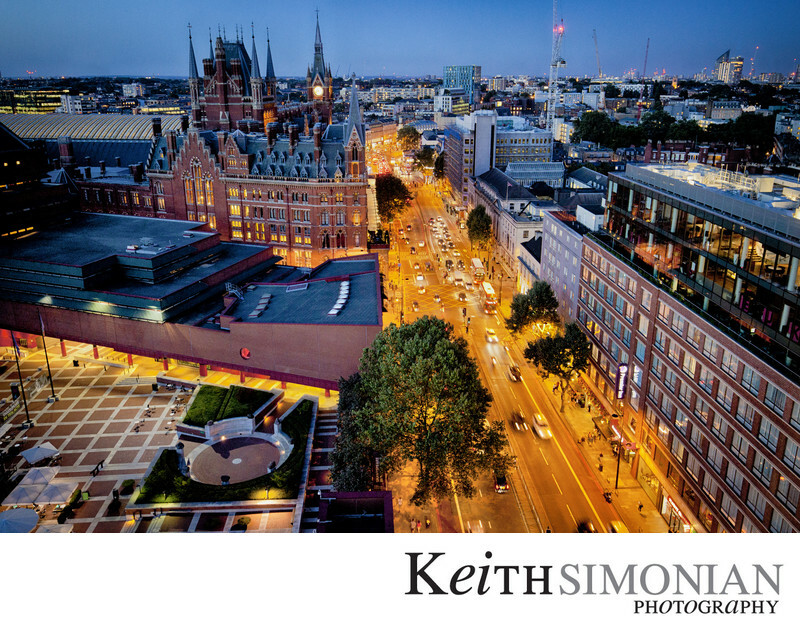 This twilight view of London taken from the 15th floor of the Hotel Pullman features the British Library, King's Cross Station and the St. Pancras Renaissance Hotel London on the left side of Euston Road. While the right side of the street provides an areal view of the London Borough on Camden and some of the many cranes that dot the London skyline. When I took this photo, I was under the impression the 15th floor was the top floor I had access to. Turns out I could have gone up one more floor, though I don't think the image would have been much different one floor higher. The one 1/6 second shutter speed which gives the slight blurring effect to the traffic on Euston street was achieved without a tripod hand held by using the Image Stabilization feature of my Canon 16-35 f/4.0 lens. Even though the official sunset was for August 12th was listed as 8:30 pm, the full darkness of the sky and city isn't yet apparent in this twilight photo taken at 9 pm on that night. The image was made through a glass window with this view, and to avoid reflections of one's self and the bright objects in the room, the camera lens must be very close to the glass. Location: St Pancras International, Euston Rd, Kings Cross, London NW1 2AR, UK. 1/6; f/4.5; ISO 1600; 27.0 mm.